You are here: Home / Magic Love Bus Journey / The Magic Love Bus and LovEvolution Crew Complete their coast to coast Journey of the Heart. In mid April the Magic Love Bus Journey cast off from San Francisco dedicated to “healing divisions – coast to coast” by bringing people of all colors, creeds and classes together on the Bus to share music, food, ideas and their hearts. Since then Bus has hosted free events all across America, providing a platform for free expression and a vehicle for personal and group transformation. 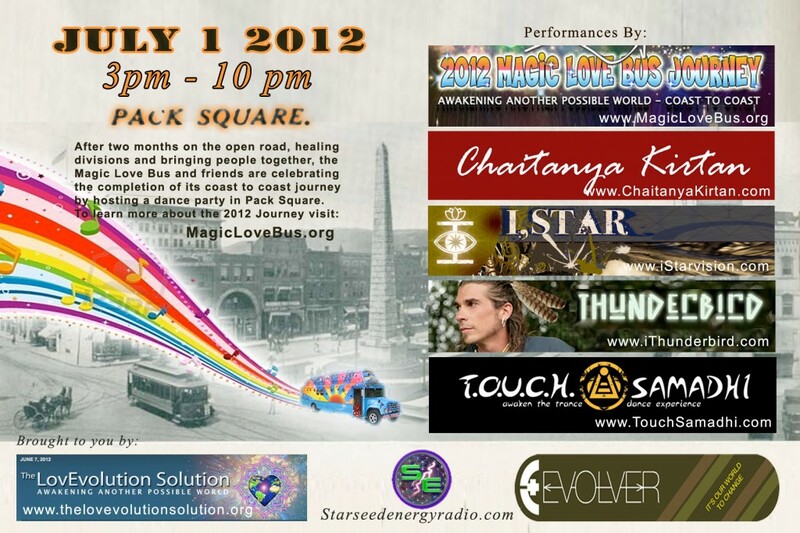 Highlights of the 2012 Magic Love Bus Journey across America. Evolver Asheville meeting – Evolver is a new social network for conscious collaboration. It provides a platform for individuals, communities, and organizations to discover and share the new tools, initiatives, and ideas that will improve our lives and change the world.